MAN Truck & Bus today announced an important milestone with the company celebrating 100 years of commercial vehicle manufacturing. 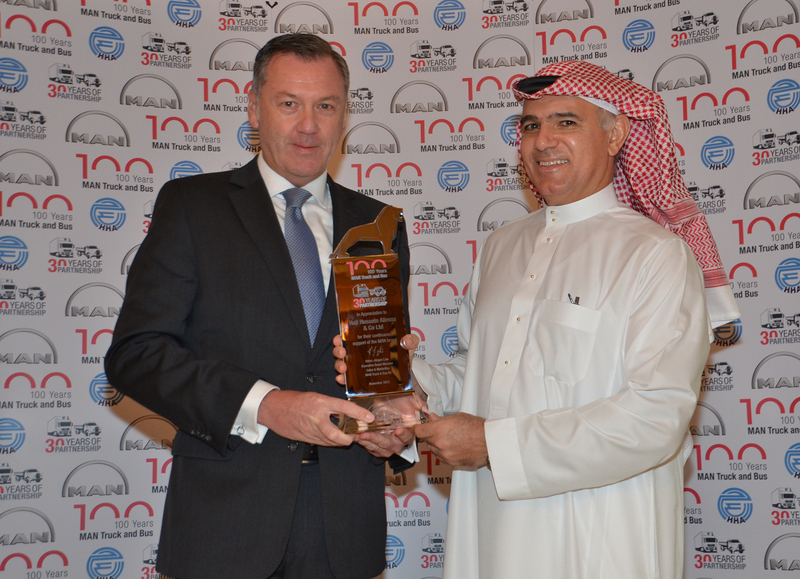 This year also marks the 30 year anniversary of MAN Truck & Bus’ association with its valued importer Haji Husein Alireza & Co. Ltd. (HHA) in Saudi Arabia. Top officials from both companies gathered at events throughout the country to mark the occasion and celebrate their association in the presence of employees, partners and prominent customers. 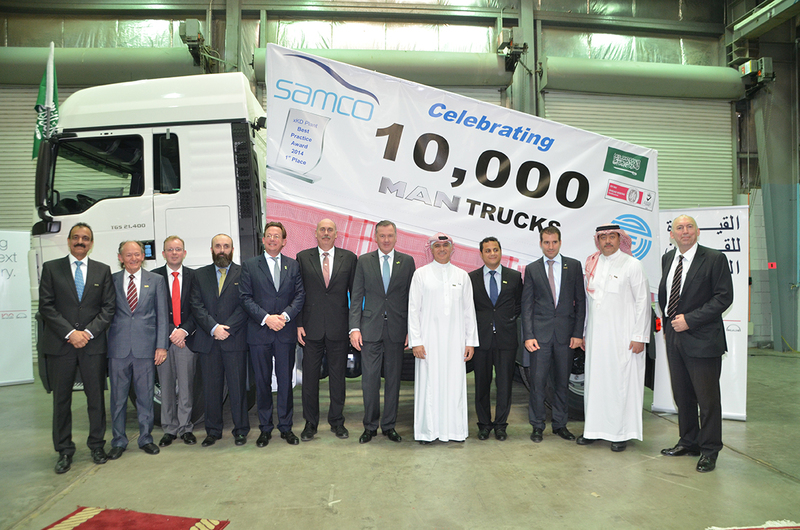 Both MAN and HHA also celebrated another significant milestone with the 10.000th truck built at Saudi Automotive Manufacturing Company (SAMCO). The SAMCO Jeddah Assembly plant, which opened at the start of 2009, has been an important pillar of MAN’s Middle East growth strategy. Here is an overview of the most important MAN Truck & Bus milestones. On 21 June 1915, a new company was entered in the trade register of the City of Nuremberg: "Lastwagenwerke M.A.N.-Saurer". The company was established as a joint venture between Maschinenfabrik Augsburg-Nürnberg AG and Saurer, a Swiss producer of commercial vehicles. In 1924, MAN presented the first truck with a direct-injection diesel engine – which created the basis for the triumph of diesel engines in truck construction. It saved up to 75 percent of operating costs in comparison with the petrol engines common at the time. In the 1950s, the MAN F8 with its 180 hp V8 engine became the flagship of the economic miracle in the new Federal Republic of Germany. MAN demonstrated its level of innovation as early as 1951, when it introduced the first German truck engine with exhaust gas turbo-charging. The six-cylinder engine achieved 175 hp with an 8.72-litre displacement, a remarkable power increase of 35 percent. MAN also proved its innovative powers in bus construction. In 1961, the company introduced the 750 HO to the market, the first bus in modular design. However, MAN's showpieces have always been trucks with hoods for construction work and heavy Cab-Over-Engine trucks for long-distance transport, such as the Type 19.280, which was the first MAN truck to receive the "Truck of the Year" award in 1978. Numerous awards followed, for example for the MAN F90, which was introduced in 1986 and received the "Truck of the Year" award the following year. The introduction of the D20 engines with common rail injection in 2004 was a real milestone in engine technology. MAN also modernised the light and medium series by introducing the TGL and the TGM in 2005. It was possible to achieve Euro 4, the exhaust gas standard at the time, by a combination of exhaust gas recycling and particle filters, entirely without additives such as AdBlue. Two years later, two models were presented to succeed the TGA in the heavy series; The TGX was designed for long-distance transport while the TGS was used for applications requiring traction and heavy distribution traffic. MAN received the "Truck of the Year" award for the seventh time and for both models - which is a record in this sector. The development of resource-saving and environmentally friendly vehicles has always been one of the main goals of MAN Truck & Bus. Euro 6, the latest exhaust gas standard was a challenge that MAN met in 2012 with its latest generation of TG vehicles. In the autumn of 2014, MAN introduced the latest engine generation, the D38, which is currently the culmination of 100 years of engine development in commercial vehicles. MAN's developers are already working on vehicles that no longer need a driver for certain activities, for example when a safety vehicle secures motorway building sites. MAN Truck & Bus will use these and completely new ideas to ensure sustainable development of ultra-modern business vehicles in the future.